Do you know what Neptune Grass is ? Neptune grass grows in the sea near the coast and forms underwater prairies. We often find heaps of weed on the beach that have come out of the sea and which we call algae. These piles of dry weed should not be abhorrent to us; they are not dirty, but just remains of a marine plant, known as neptune grass (Posidonia oceanica), which the sea throws up onto the coastline. The presence of neptune grass is considered by scientists to be the best indicator of good beach management and health, and a clear and unequivocal sign that the sea water and the coastline are in good condition. They play an indispensable part in our environment. They protect the beach from the force of the waves and give stability. They also bring in sand. They produce oxygen and organic material, both vital for giving life to many species. They give shelter to a multitude of living organisms: sea urchins and starfish, cotton spinners, sponges, shells and other mollusc's sea anemones, algae.. and many species of fish that find food and refuge there and also a suitable place to lay their eggs where the small fry can grow up safely. Being vigilant over their conservation protects the good health of the beach. I have included a 'Worth a visit rating' with most of the beaches and resorts descriptions. These are my personal views and relate to taking a trip out to visit them and not taking your holiday in the resort. 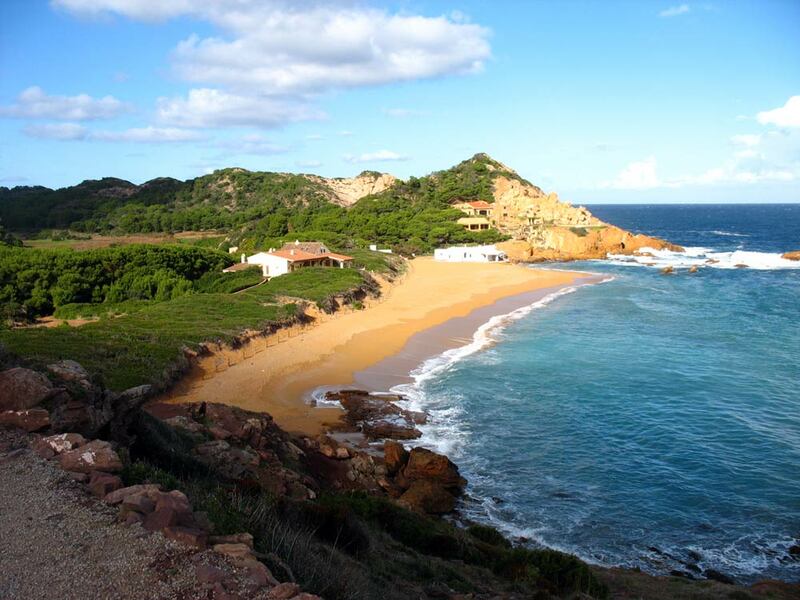 Punta Prima to the east of Sant Lluis is Punta Prima a large beach of fine white sand very rocky at the eastern end. It can be dangerous with strong currents when the wind blows from the right direction. I urge all parents with small children to keep an eye on them when out swimming. Situated in a small but growing resort with a good selection of bars and shops, easy parking right on the beach, sun beds water sports etc. Binibequer south of Sant Lluis Binibequer has a small sandy cove. 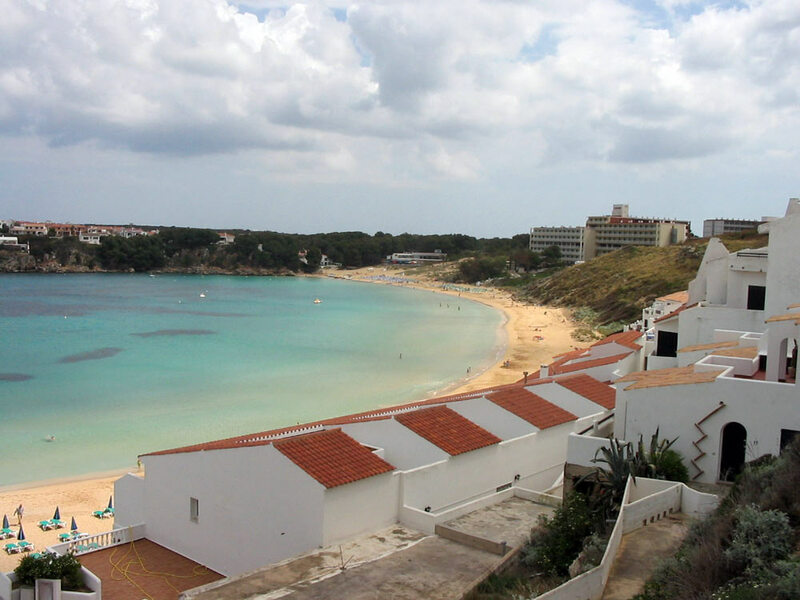 With Binibeca vell to the west & Cala Torret to the east both with a selection of bars and restaurants. Binibequer is all privately owned villas and apartments, not a hotel in sight. Beach bar (renowned the world over) sun beds water sports easy parking. Cales Coves on the Mahon to Cala'n Porter Cales Coves has a small coarse beach [not one that you would spend any time on] reached by a short walk down a steep sided limestone gorge. There are many caves high up in the walls of the gorge, making the exploration of this area very exciting for children and there dads as well, no facilities at all. Swimming and snorkeling from the rocky shore is recommended. 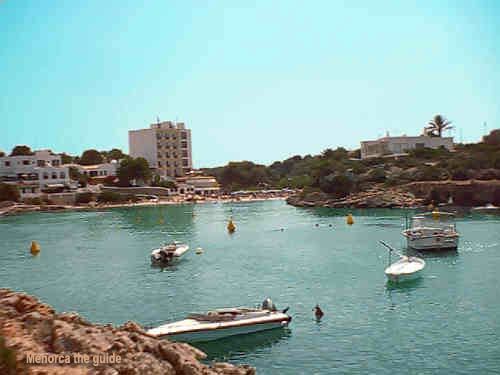 Cala en Porter on the coast south of the airport, Cala'n Porter has all the facilities of an established resort. The beach is reached from the resort by steps, lots of steps, or down the road from the center. Good beach with everything one needs, easy parking, beach bars, sun beds, life guard with warning flags and water sports etc. Son Bou -San Jaime south of Alaior Son Bou has the longest beach on Menorca. It has three modern beach bars connected by a wooden path. A red cross hut with lifeguards, Sun beds, good choice of water sports and plenty of space. To the west is popular with naturists. Son Bou can suffer from strong currents, please take notice of the red cross warning system. 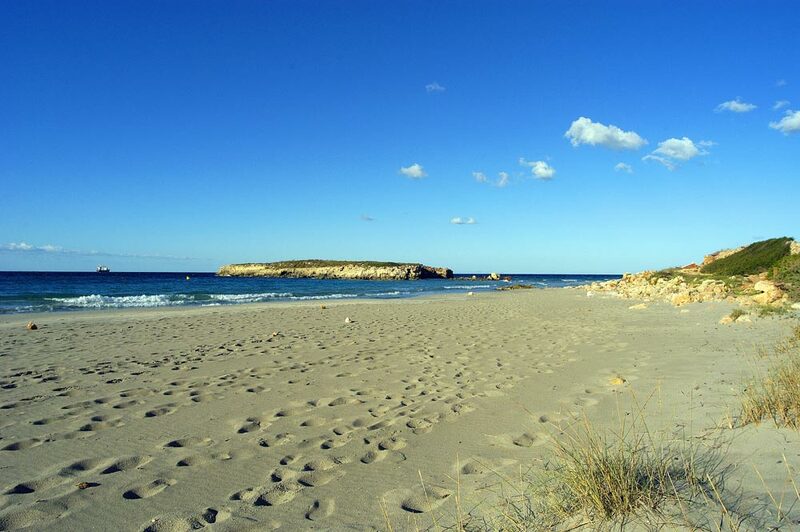 Santo Tomas A little further west than Son Bou and through the village of Es Migjorn Gran Santo Tomas can be found. A long narrow strip of soft white sand [rocky in places] backed by hills. 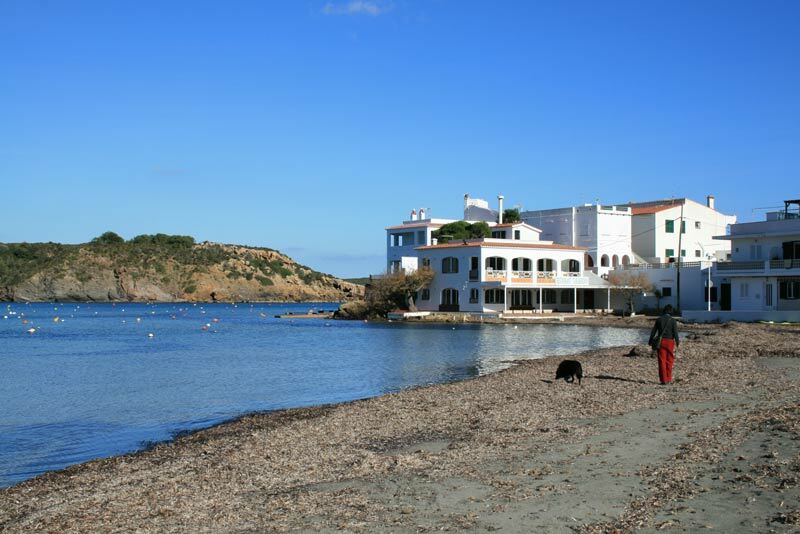 A very quiet resort with beach bars, water sports and parking facilities and life guard. Cala Mitjana South of Ferreries, situated down a small rocky track off the road from Ferreries to Cala Galdana, on the left hand side just before Cala Galdana but at the end lies a idyllic south facing cove, bounded by wooded cliffs. Easy to park, but no facilities. Cala Galdana South of Ferreries Cala Galdana is known as the "Queen of the calas" it is a beautiful pine clad bay. The beauty of the bay still stops me in my tracks even now when we visit , with all facilities, beach bars, restaurants and water sports. 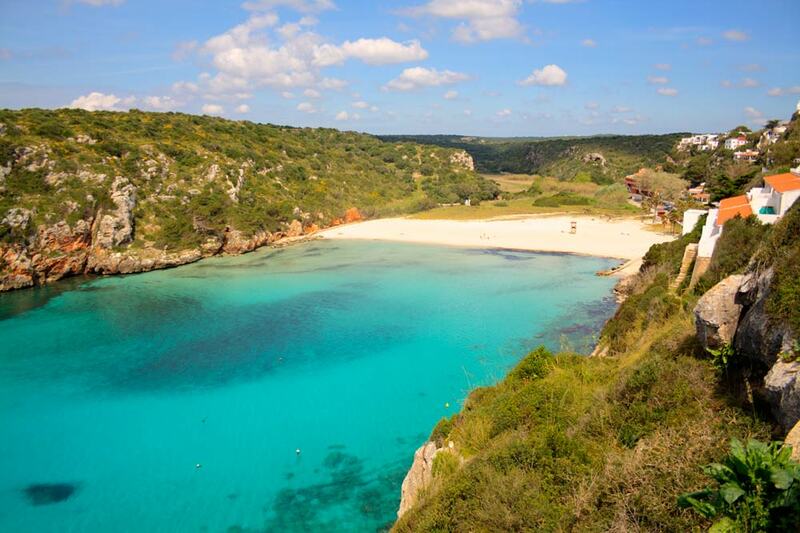 The Image of Cala Galdana to the right is 1000 x 230 pixels in size. Cala Turqueta Just as nature made it, no facility's at all just a butifull natural white sandy beach. Sign posted from Ciutadella's southern ronda [bypass] One of Menorca's gems, this along with others is protected, very limited access and a charge for car parking. Open from 10:30 till 17-18:00 but get there early in the summer months. Signs on the way inform of the free parking spaces on this and other beaches near by. Easy access but take food drink and shelter from the sun. 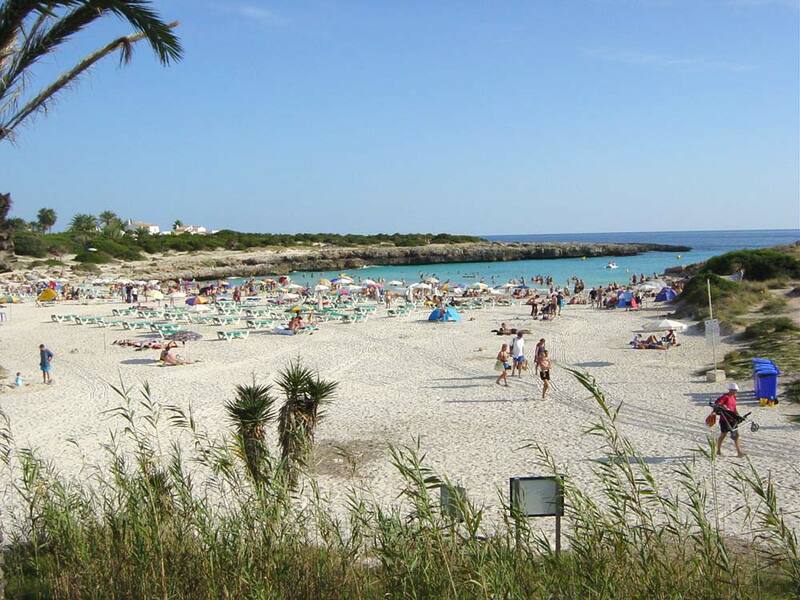 Son Xoriguer - Cala'n Bosc South of Ciutadella Two smallish beaches of white sand. 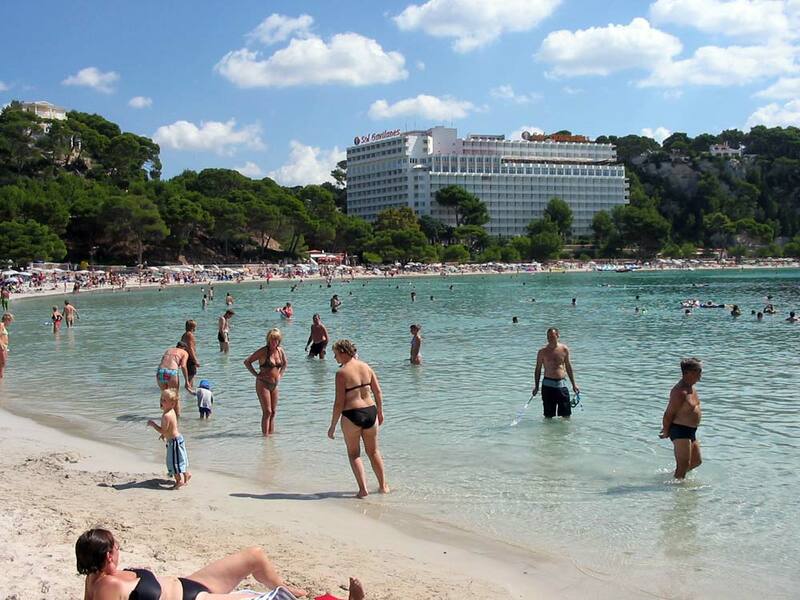 large resort centred around a marina Easy access, ample parking, beach bars and restaurants. Water sports are a specialty. A beach ash tray costs less than a packet of cigarettes and apart from the unsightly mess, filters take years to degrade. Please clear all your rubbish up and dispose of it in the bins provide and Keep the beaches clean. As you would, no doubt wish to find them, if not for you, for your children Thank you. 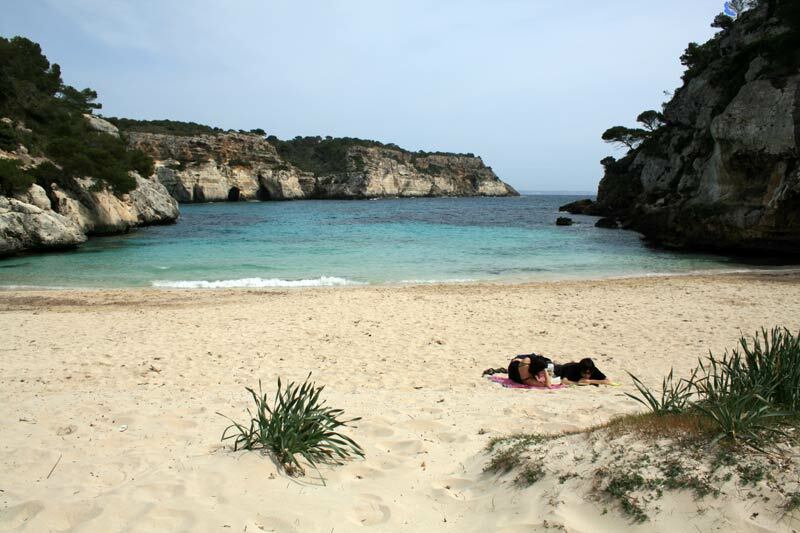 Most of the beaches on Menorca are well worth a visit and I would recommend hiring a especially if you have children. A different beach to explore make for an exciting holiday for them and a relaxing one for you. A good tip here is "If the wind is blowing from the north visit the south coast beaches, and visit the north if the wind is from the south"
Arenal D'en Castell On the north coast The beach is an almost perfect circular cove, with fine sand gently slopes into the water. This is a good family resort. Beach bars, restaurants and all types of water sports available and a life guard. Son Parc On the north coast Son Parc has a large white sandy beach, (In my opinion one of the best on the island) It's ideal for children as it's very shallow for the first 20-30 meters. Good parking near the beach, Beach bar and water sports of all kinds. 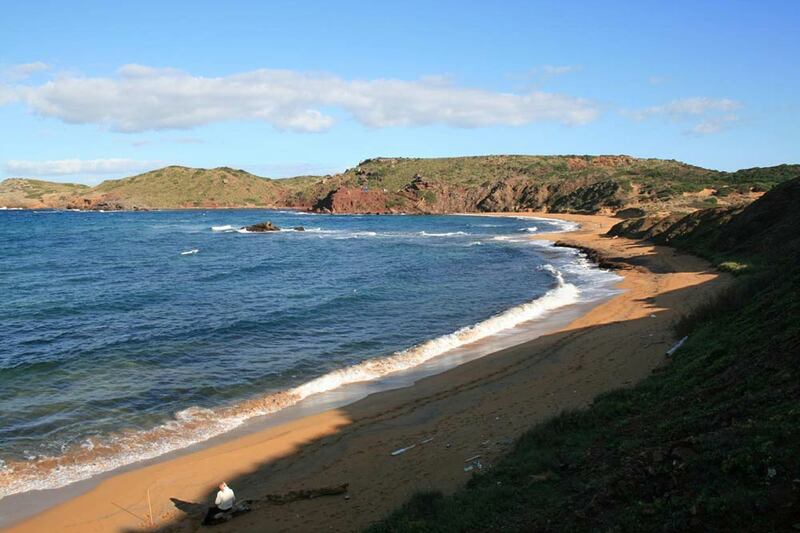 Agaiarens - La Vall North coast west of Cavalleria classified as an area of special interest. Beautiful unspoiled beach with dunes. Walks and picnic tables with panoramic views of the area, toilets and car parking. An outdoor Museum is 2 km away towards the lighthouse, where there are toilets and a small bar. 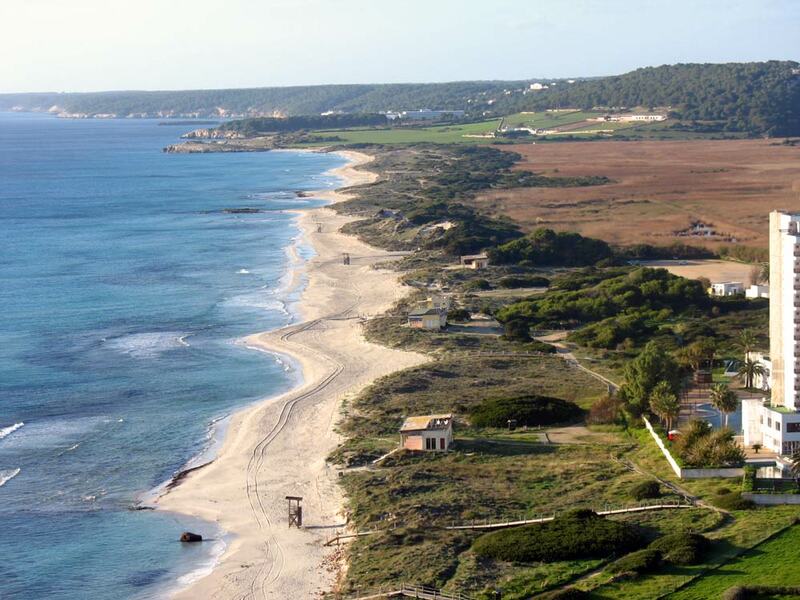 Es Grau North of Mahon Large sandy beach backed by dunes, pines and tamarisk trees, leading to salt water lakes and marshes of the S'Albufera park. The sea is very shallow for quite a distance, making it ideal for small children to paddle in relative safety. The whole area is a National Park. The small village of Es Grau provides a few bars, restaurants and shops. 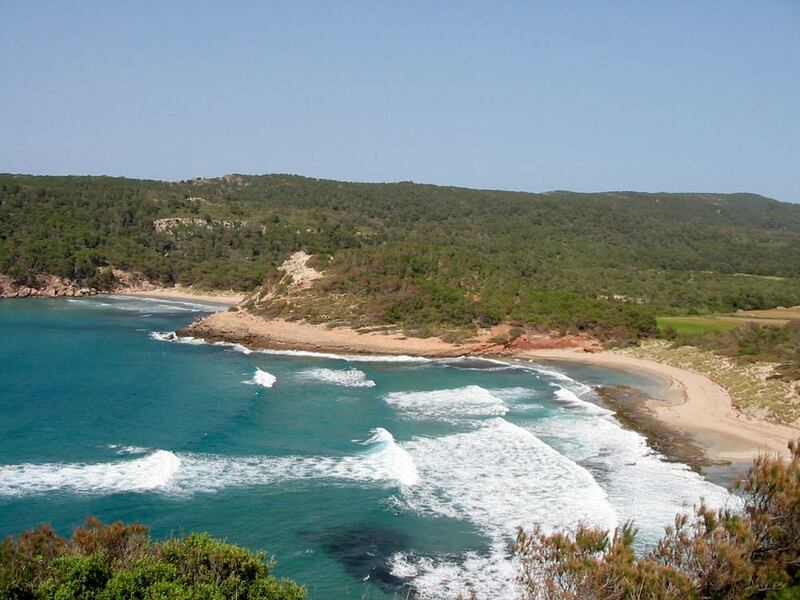 Cala Macarella, & Macarelleta South of Ciutadella a pair of extremely picturesque pine fringed cove's. Approachable by car from the outer ring road at Ciutadella, or by foot from Cala Galdana [quite a long walk]. Beach bar and sun beds etc. for hire. 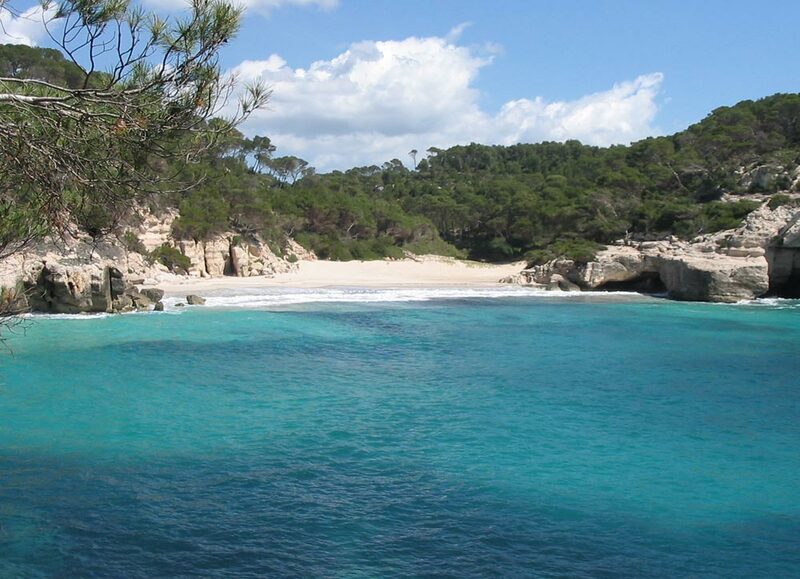 Take a five min walk around the cliff to Macarelleta well worth it Don't take anything with you then swim back. Cala Santandria Just south of Ciutadella is Cala Santandria. 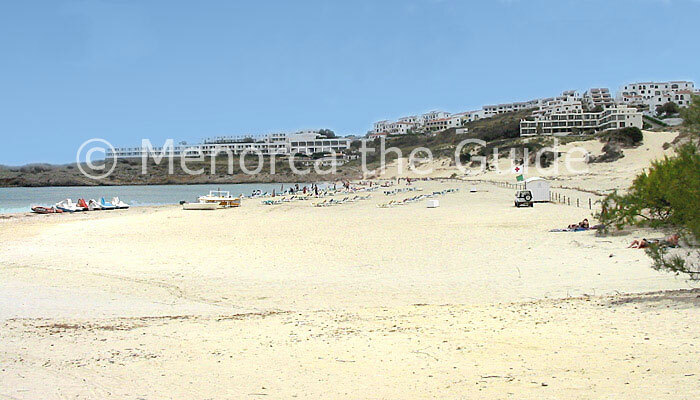 Narrow resort beaches at the end of a long Cala, beach bars and restaurants, sun beds, water sports and all the facilities you need. Cala Blanca Just south of Ciutadella is Cala Blanca. 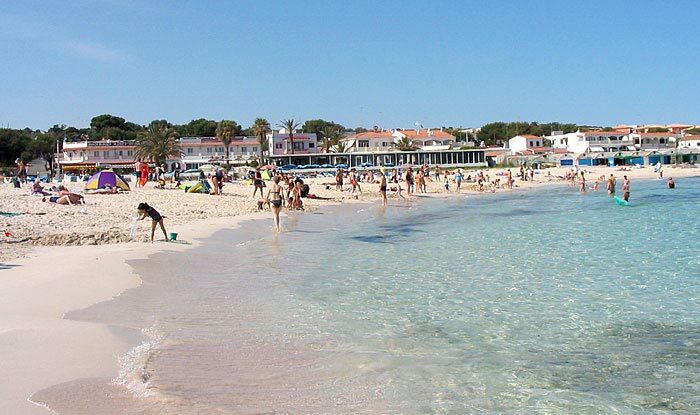 Small picturesque resort beaches with all the facilities you need sun beds pedalos choice of beach bars serving hot and cold food and drinks. 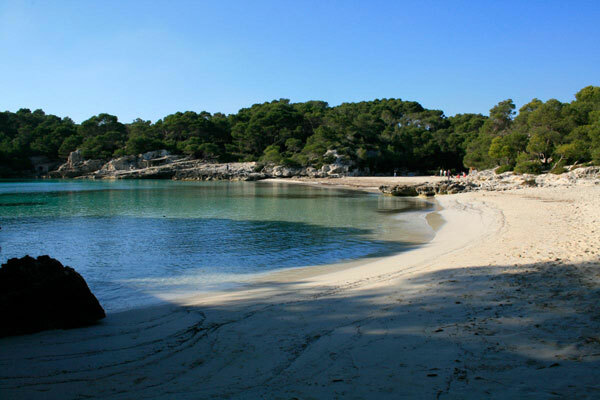 Cala Pregonda West of Fornells Access is by a 20 min walk from Binimella This beach is outstandingly beautiful. A sandy beach surrounded by unusual rock formations, pines and tamarisk, no facilities. Cavalleria West of Fornells on the road to Cala Pregonda This beach is outstandingly beautiful. A long golden sandy beach backed by rocky hillside, pines and tamarisk, no facilities. Keep the beaches clean as you would, no doubt wish to find them thank you. It might be wise to tell people about the "unique" roads they have to some of the beaches, many times I have been tossed about and stopped by cattle on the patchwork of tarmac that is oh so worth driving on to get to the beach. Thank you Andy.